A little rebate to get you closer to a little adventure. 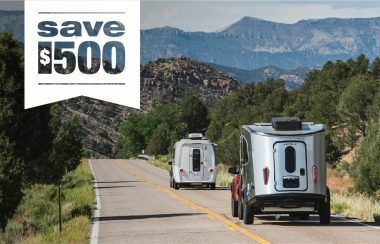 Fill out the form to claim your $500 rebate on a 2019 Nest by Airstream™ – our smallest travel trailer that offers you big comfort, convenience, and style. As a bonus, you’ll also get a product brochure to help you shop. Ready to make Nest yours? One of our Adventure Advisors can answer any questions you may have. Request your rebate and product brochure.